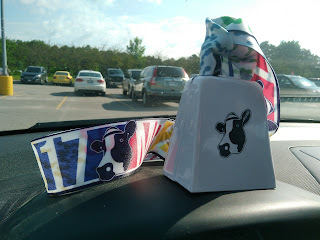 Most races need more cowbell... not this one! Check out the cool finisher's medal. Really great race - well organized, I was a little concerned the 21.1k wouldn't go off quite as planned but it was perfect. As advertised there were aid stations every 2-3km, it was really awesome. Only small quibble - not all had Gatorade...... some just had water. But it was OK. Course was mostly flat - there's elevation change but it's subtle, being about 80% on rail trail. Rail trail was mostly hard packed gravel/sand, it was a decent surface for the most part. Best of all - Kawartha Lakes Dairy provided FREE ICE CREAM (and milk!) at the finish! Mmmmmm that hit the spot (especially in the heat and sun). Highly recommend this race - 5k/10k/21.1k options. For the half marathon, we had to be there at 6:15am for the bus to the start (it's point to point) - so from Whitby that meant a 4.30am wake up. Ouch. Extra coffee and some rockin' tunes to wake me up on the drive up and I showed up ready to rock. I lined up with the pretty serious looking half marathon crowd. Running Free had pacers there - which was great, except I had no idea what pace I wanted. We started with a short downhill, which always messes me up a little with pacing. I let it fly then tried to settle back into something near 5:00/km. I was pretty unsure of how I'd feel today, so my pacing plan was "whatever my legs were telling me". And at the start they were saying "we feel good, let's go!". I held back a little but was managing pretty close to a 5:00/km pace at the start. After a short climb we hit the rail trail. The surface is gravel/sand and mostly pretty well packed - maybe a little slower than asphalt, but not by much. Certainly it's softer and more forgiving. At the halfway point my pace was 5:02/km - and it felt like we'd gained some elevation. I was thinking 5:05/km would be a reasonable goal time. Stupidly, though, I hadn't checked the elevation of the finish to compare... so we actually weren't going to be going downhill much after this point, and the overall course is slightly net uphill! There's a bridge over the lake at 12k - this is the lowest point in the course, and from there my pace started to die as we went back up. It's not steep (being a rail trail and all) but it's noticeable. I tried to ignore my pace and just watch heart rate and go by feel. One lady commented that she had "never seen someone sweat so much they left wet footprints" as I went by. HAHAHA that gave me a chuckle. But I was seriously dripping sweat, I'm bad for it at the best of times, but I probably lost several pounds of fluid. Hard to make up with those little cups of Gatorade! I managed to find some pace for the finish but even with the net downhill I was only managing 5:07/km at this point... for a final pace of 5:11/km (1:49:42 finishing time). Considering I biked 200km just 36 hours before this race, I'm pretty happy with that. It is what it is! I was completely wiped at the finish - chugged down a couple of chocolate milks to try get some salt back in me, water, and of course two bowls of delicious Kawartha Dairy Ice Cream! (I'm not affiliated with them, other than enjoying their ice cream). Not a bad race for me, and as an event it was really excellent. I'll be back for sure!